Nicole Clark and Brad Case’s family have been growing grapes on their Langhorne Creek property for many decades, but the opening of their first cellar door next month will mark a new direction for a new generation. The sister and brother – descendants of Frank Potts, who established the region’s first vineyards – hired award-winning architect Damien Chwalisz to design the smart new building for Kimbolton Wines. It incorporates four industrial shipping containers which Clark says have been used to create five distinct spaces: a tasting bench area, a tasting room, a courtyard, a ground-level deck and a rooftop deck (to be added later). 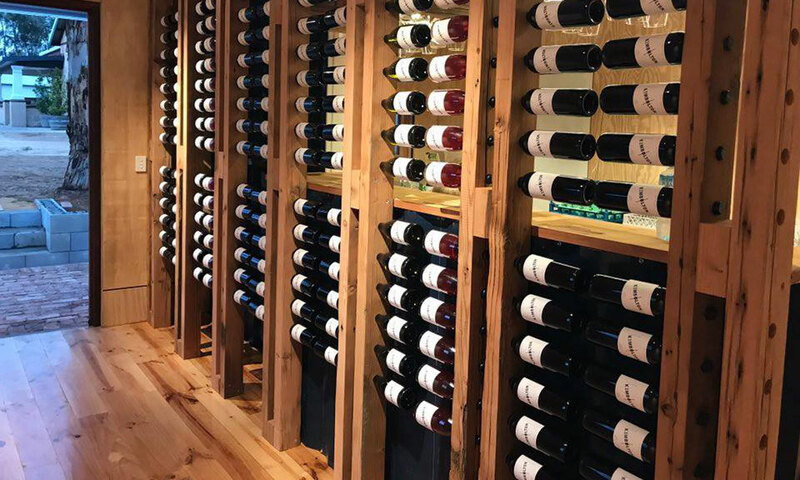 Recycled timbers – including oregon used for a series of striking display wine racks – help create what is described as an “earthy, modern feel”, with the cellar door located among gum trees right on the edge of the vineyard. “It’s just a gorgeous space … it’s really tranquil,” Clark says. Wine display racks made from recycled oregon timber. The Kimbolton story reaches back more than 100 years, with the vineyard located on land originally purchased by Frank Potts in 1911. The block was inherited by one of his sons, Charles Dudley; after he was killed in World War II it was bought by Dudley’s sister and her husband, Henry and Thelma Case, before their son Len and his wife Judy took over the running of it in 1969. It’s now owned and run by their children, Brad and Nicole. Until 2002, the family were solely grape growers supplying fruit to other wineries, but in that year they launched their own Kimbolton wines with a single release of Cabernet. While the vast majority of grapes grown on the 57ha of vineyards still go to other wineries, Kimbolton now crushes about 20 tonnes for its own label and has grown its range to 12 wines. These were previously available for tasting at Langhorne Creek’s The Winehouse. “The wine brand has now grown enough to spread its wings and be a cellar door in its own right,” Clark says, explaining the impetus for the new building. “The last year my brother and I have been running the business pretty much full time since taking over from our parents, and I look at what they have done and achieved, from what they took over from my grandparents, and now this is the legacy that Brad and I want to leave. The new cellar door, which is licensed for 100 people, has a VIP launch this weekend and will open to the public on December 10, offering tasting flights paired with SA cheeses from producers such as Woodside, Alexandrina and Section 28. From January, it also intends to offer platters. “The rooftop deck will be added early next year, too, so you can go up on the deck and look over the vineyards,” Clark says. 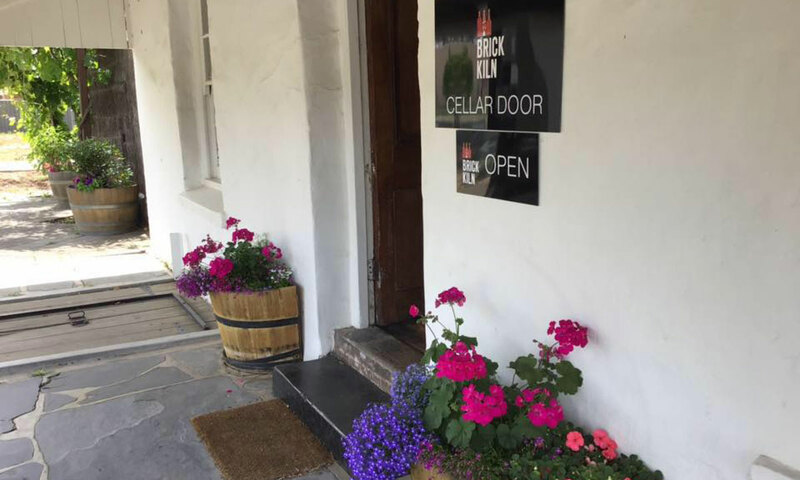 Brick Kiln: McLaren Vale boutique winery Brick Kiln has opened a new cellar door in the front room of The Barn restaurant – another site with a rich history. Built in 1840 and originally a staging post on the Adelaide – Victor Harbor Road, The Barn was renovated in 1969 by David Dridan and David Hardy and turned into a bistro and art gallery. When its latest owners sought interest from a cellar door keen to occupy the space at the front of the building, Brick Kiln owners Malcolm and Alison Mackinnon answered the call, relocating their cellar door from its previous home at Red Poles restaurant. They’ve given the room a makeover, installing a tasting bar and lifting up the old carpet to expose the beautiful old pine floorboards. Malcolm says the cellar door is offering tastings of a number of Brick Kiln wines (all made by Phil Christiansen), including its Brick Kiln “The Grove” Shiraz, matured in French oak for 18 months, and the 2013 Super Reserve Shiraz, “The Ingot”, which was also matured in French oak and won a silver medal in the 2015 Great Australian Shiraz Challenge. “In summer we hope to use the outside area that fronts onto the main road because that’s licensed to us as well,” he says. Chateau Tanunda: The 128-year-old Barossa icon Chateau Tanunda is this week launching its new cellar door – complete with a 6m x 3m “Great Wall” display built from old oak barrels to showcase some of the winery’s special releases. The cellar door is in the blue-stone chateau’s old barrel room, which has been closed for four months for an extensive refurbishment in the latest of an ongoing series of improvements by owners the Geber family. It includes new tasting areas and a mezzanine space, and will offer tasting flights featuring wine such as The Everest Shiraz and The Everest Old Bush Vine Grenache, which sell for more than $210 a bottle, and releases from the Old Vine Expressions range, made from the grapes of vines between 50 and 150 years old. Fox Gordon: After making a brief debut during the Winter Reds festival, Adelaide Hills winery Fox Gordon’s new Kuitpo cellar door will open to the public this weekend. As The Forager reported in July, it is located in one of the original sheds on the property – previously a dairy farm – which has been repurposed with the addition of a deck and bifold doors to maximise the view towards the vines. The Kuitpo cellar door will open every weekend and will also host food trucks, with Gourmet Papa’s Hotdogs on site this Saturday.